What is man without God? Is man good or able to be good without divine help? Can man achieve favor with God based on their own merits? Ezekiel and the Apostle Paul have valuable insight on these questions and Oswald Chambers does a marvelous job on a familiar passage from the Old Testament to present a brilliant explanation. Son of man, can these bones live? -Ezekiel 37:3. “Behold, O my people, I will open your graves.” When God wants to show you what human nature is like apart from Himself, He has to show it to you in yourself. If the Spirit of God has given you a vision of what you are apart from the grace of God (and He only does it when His Spirit is at work), you know there is no criminal who is half so bad in actuality as you know yourself to be in possibility. My ‘grave’ has been opened by God and “I know that in me (that is in my flesh) dwelleth no good thing.” God’s Spirit continually reveals what human nature is like apart from His grace. The remarkable truth of the gospel is that God can, and does through the work of his Son on the cross and his resurrection, give dry bones new life. 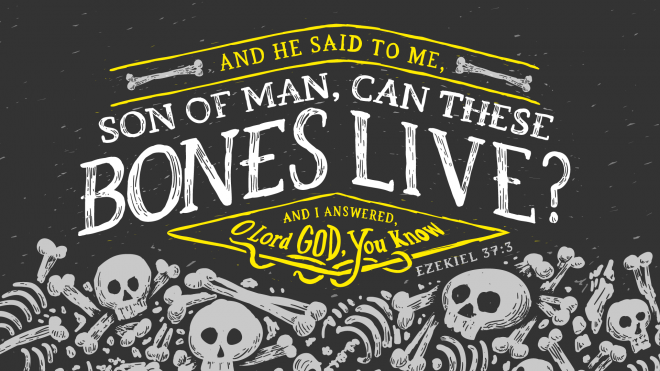 This work does not come through the prophet Ezekiel who was called the son of man, but the power to give the dry bones life only comes from the Son of Man, Jesus Christ. Do you believe that? Will you be like Ezekiel who responded, “O LORD God, you know!” Can you say with the Apostle Paul, “For I know that nothing good dwells in me, that is, in my flesh. For I have the desire to do what is right, but not the ability to carry it out!” These men knew the power required to give dry bones life and the power could only come from the Son of God, the Son of Man, Jesus Christ. Apart from him, we can do nothing. His grace is sufficient for you.